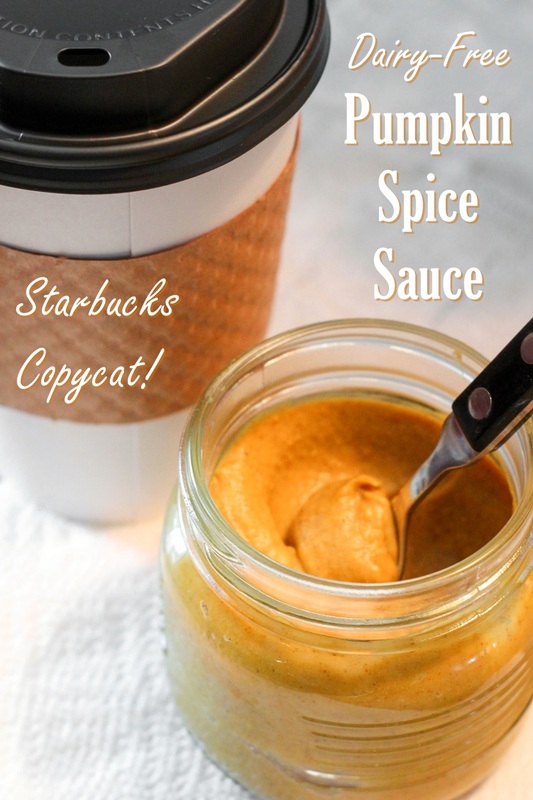 When trying to create a Dairy-Free Copycat Starbucks Pumpkin Spice Latte, I looked at many, many copycat recipes online. Most of them use water-based pumpkin syrup as an ingredient, with very little pumpkin in the syrup itself. Starbucks lists a condensed milk-based pumpkin spice sauce in the ingredients for its pumpkin spice latte. I followed their lead and created a coconut-milk based dairy-free pumpkin spice sauce to use in dairy-free pumpkin spice lattes. Starbucks also uses annatto in their Pumpkin Spice Sauce to make it a pretty orange color. I added a bit of turmeric to my sauce to brighten the color instead. 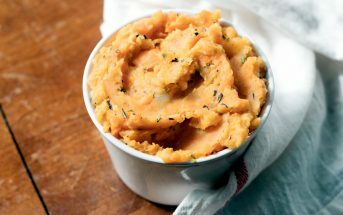 The end result uses an entire 15-ounce can of pumpkin puree and tastes like eggless pumpkin pie filling. This Pumpkin Spice Sauce has a lot of fun uses beyond Pumpkin Spice Lattes. You can also enjoy it in dairy-free pumpkin spice steamers, or on pancakes, waffles, or ice cream. 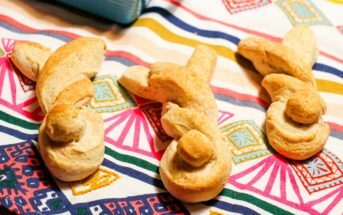 By ingredients, this recipe is dairy-free / non-dairy, egg-free, gluten-free, nut-free, peanut-free, soy-free, vegan, vegetarian, and top food allergy-friendly. 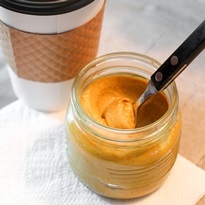 I created this vegan sauce for making Starbucks-style pumpkin spice lattes, but it's also great on dairy-free pancakes, waffles, and ice cream. 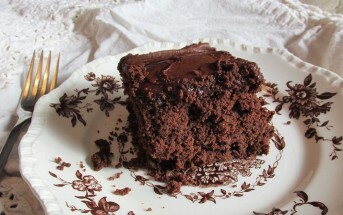 And it's a recipe you can make simply from pantry ingredients! Put the pumpkin, coconut milk, sugars, cinnamon, ginger, turmeric, salt, and nutmeg in a medium saucepan, and whisk until smooth. Place the pan over low heat and simmer the mixture for 20 minutes, stirring occasionally. Strain the sauce through a fine-mesh strainer to ensure it is completely smooth. 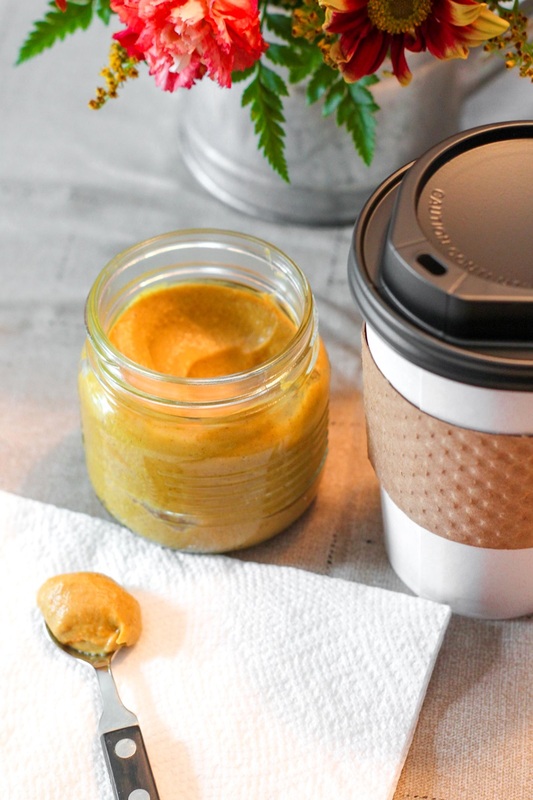 Store your dairy-free pumpkin spice sauce in an airtight container (I use a canning jar) for up to 1 week. 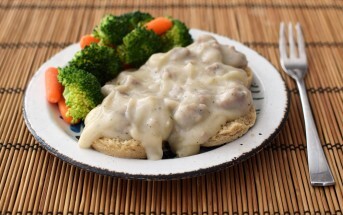 For More Dairy-Free Comfort Food, Get Go Dairy Free! Interesting recipe. I had 2 questions. After making the sauce could I put it in an ice cube tray and freeze the sauce which could keep for the whole year? I’d have to pre measure the sauce on order to use the correct amount when removing from the freezer. Also could I use coconut milk drink as a more healthy substitute? Hi Daniel, Thanks for your questions! I haven’t tried either of these options. I wouldn’t keep any sauce you freeze for up to a year, but for a couple of months should be all right if you decided to try to freeze it. I don’t know if the sauce would separate if frozen and then thawed. As for using a substitute for the canned coconut milk, that would affect the consistency of the sauce. Since you are using only 1-2 tablespoons of the sauce per drink, I don’t know if making that substitution would be worthwhile.